During the 1911 Furniture Workers Strike and its aftermath, the business community and leading industrialist, began to develop a plan that would significantly alter the way electoral politics was done in Grand Rapids. The 1911 Furniture Workers Strike revealed several things to wealthy industrialist. First, there was a growing threat of Socialist and Anarchist politics, particularly with the Socialist Mayoral candidate, Edward Kosten, in the 1912 Mayoral race. Out of the 14,772 votes cast in the Mayoral race in 1912, Kosten received a total of 2,315 votes in a three candidate race, which was roughly 1 out of 7 votes. Second, the wealthy industrialist of Grand Rapids were further committed to the notion that, in the words of Chief Justice John Jay, “the people who own the country ought to govern it.” Not only was this sentiment embraced by the wealthy industrialist in Grand Rapids, it was endorsed by Frank M. Sparks, the political correspondent for the Grand Rapids Herald. Sparks had written a book, The Business of Government Municipal Reform. Third, the wealthy industrialist were deeply concerned about the current political ward system in Grand Rapids. The majority of working class people had too much influence in the outcome of elections, so a new ward structure was proposed in the 1916 City Charter. 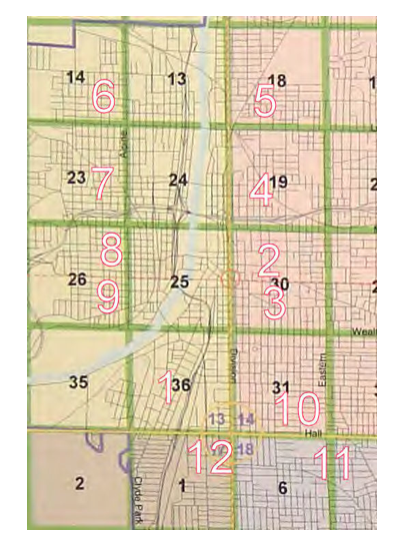 Grand Rapids, at the time, was made up of a twelve ward system, with 2 aldermen elected from each ward and a strong mayor. (see Grand Rapids ward map above) What was proposed in the 1916 City Charter was to have a three ward system with two commissioners from each ward and a weak Mayor, meaning that the Mayor would only have one vote and in a sense be a glorified commissioner. In addition, there would be a City Manager position, which would essentially run the day to day tasks and make recommendations. For many, the City Manager position was the real power behind city hall. This third factor, in determining the city’s political future, would limit bloc voting, particularly among ethnic communities and religious sectors, and give greater control to electoral outcomes. The voting numbers in the 1916 Grand Rapids City Charter were revealing. By contrast, those who voted against the City Charter changes in 1916 were made up almost entirely of working class constituents. The wards voting against the changes were the twelfth ward in the southwest part of the city and the entire west side. 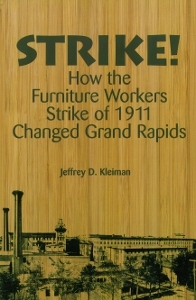 Again, according to Kleiman, “After a decade of struggle, the furniture manufacturers and other economic leaders of the new industrial city finally controlled the government.” We would all do well to recognize this history of the voting structure in Grand Rapids and not assume that it has change changed much over the years. This entry was posted in Anti-Capitalism/Labor, Neighborhood organizing and tagged 1911 furniture workers strike, 1916 Grand Rapids City Charter change, Grand Rapids wealthy industrialist, Wealthy Industrialist want 1916 charter change. Bookmark the permalink.